Dr. Valeri Sacknoff has been acknowledged numerous times by her professional colleagues as one of San Diego Magazine’s “Top Dentists.” She has received the award for many consecutive years, including every year from 2013 through 2017. From routine cleanings to state-of-the-art dental implants, Dr. Sacknoff strives to provide the highest quality of dental care while doing everything she can to make patients as comfortable as possible. Some of her top priorities include helping individuals overcome their fear of the dentist and improving their oral health by providing state-of-the-art treatment techniques and thorough information on how to maintain healthy teeth and gums. In addition, Dr. Sacknoff is committed to providing patients with respectful, compassionate care. She treats every person who walks through our doors the same way she would like to be treated! Dr. Valeri Sacknoff grew up in Chicago, where she earned her Bachelor of Science in Public Health and Dental Hygiene in 1975 from Loyola University. After practicing as a dental hygienist for five years, she continued her dental education and received her Doctorate of Dental Surgery from New York University in 1981. In 1983, she moved to San Diego, where she raised her three daughters in Rancho Peñasquitos and has been in private practice ever since. Beautiful office, friendly and attentive staff and as always Dr. Sacknoff does an amazing job!! My favorite dentist ever! In addition to having a father who was a dentist, Dr. Sacknoff spent 10 years working as a Dental Hygienist. This background formed a strong foundation for her belief in preventive dentistry. It also further pushed her toward her goal of becoming a dentist that patients can trust, one who will work hard to ensure they receive the best care available. 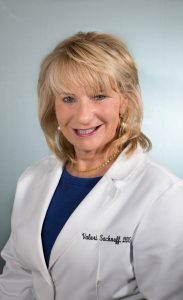 Dr. Sacknoff places a high emphasis on utilizing technologies and techniques that can enhance comfort for patients during procedures. Advanced options such as digital x-rays, CEREC® Same Day Dental Crowns, laser dentistry, and many others allow Dr. Sacknoff and her team to deliver exceptional results in a more efficient, precise, and comfortable way. Dr. Sacknoff continues to improve her knowledge of dentistry by attending dental education classes and seminars across the country. She has received additional training and education from Obstructive Sleep Airway University and the Scottsdale Center of Dentistry. Dr. Sacknoff is a firm believer in the connection between dentistry and medicine, and has a full understanding of the importance of good oral health to an individual’s overall health. Her studies at Obstructive Sleep Airway University are reflective of this; with obstructive sleep airway screening now available at our dental office, Dr. Sacknoff can work with a patient’s physician to identify early signs of severe sleep apnea (a serious health condition) and help create a treatment plan. Dr. Sacknoff is a member of the American Academy of Cosmetic Dentistry, the California State Dental Association, the Academy of General Dentistry, and the American Dental Association. Dr. Sacknoff is also dedicated to giving back to our community and utilizing her dental expertise to help those in need. Her local church presents an annual Health Fair at which both adults and children are screened for dental problems. Toothbrushes and toothpaste are also donated at the event, and important dental education is provided so that individuals can help themselves maintain good at-home oral hygiene habits. Dr. Sacknoff is also committed to volunteering at the Poway Health Fair and various community outreach programs. Outside of dentistry, Dr. Sacknoff enjoys cooking for family and friends, dancing, and many other hobbies. She and her husband love to travel, especially to Jazz concerts! Dr. Sacknoff is the mother of three daughters and grandmother to an amazing grandson, Declan.